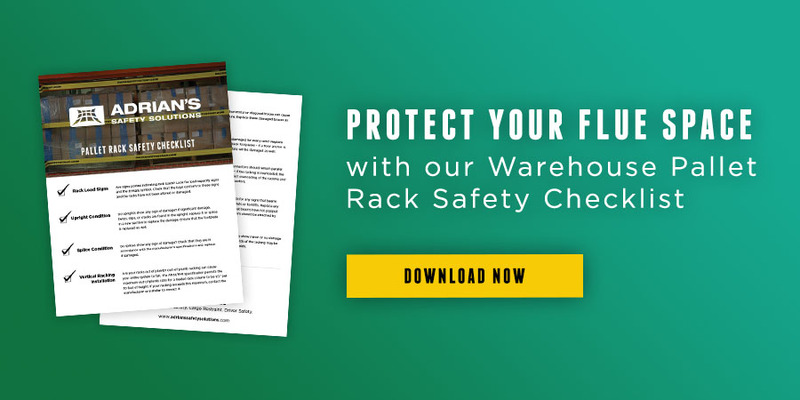 According to the U.S. Fire Administration, there are two types of flue spaces for warehouse racking. The requirements for flue space maintenance depending on the height of the racks but the purpose remains the same. Flue spaces allow vertical fire spread to reach ceiling sprinklers and for sprinklers to reach the warehouse racking without obstructions. Transverse flue space – As one faces the rack storage array, it is the space between commodities on the racks and between the racks themselves. 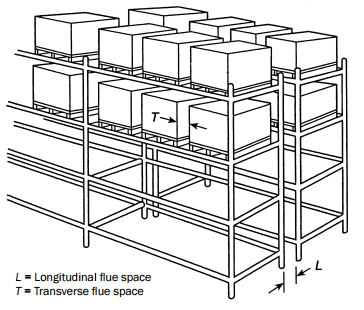 Longitudinal flue space – If one were to walk to the end of an aisle and look along double or multiple-row long dimension of the racks (back-to-back) this is the longitudinal flue space. Keeping these flue spaces clear is vital to the safety of your warehouse. In fact, NFPA Code 13 shows the results of several tests to determine the effect of closing longitudinal and transverse flue spaces. These tests showed that sprinklers cannot operate effectively when flue spaces are blocked. A proper rack safety system is essential for maintaining clear flue space. Adrian’s Pallet Rack Safety product line offers effective, simple, and affordable solutions for racking flue space compliance and work area protection. Our products do not require any tools or retrofitting, install in seconds, and are more affordable than many other safety solutions. For additional information please refer to the International Fire Code®; NFPA 13, Standard for the Installation of Sprinkler Systems; or NFPA 230, Standard for the Fire Protection of Storage.